I’m pushing this month’s Last Monday Book post back a week because of the special occurrence coming up on Wednesday. It only happens every four years, and it has nothing to do with the Olympics or a presidential election. It's fun, but it also may have gypped you of a coveted Friday or Saturday birthday. Yes, Leap Day is here again. The good folks at 30 Rock can and do make fun of everything, and last week’s Leap Day Carol episode was no exception. 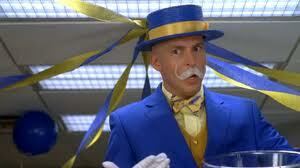 Bringing together Leap Day William (who rises from the sea every four years dressed in blue and yellow, looking like a manic Swede), fake crying for candy, the consumption of rhubarb, and Jim Carrey with gills, it was an exercise in silliness worthy of its time slot. But there was a thought-provoking nugget buried in the fun: if February 29 is a bonus day, how should one choose to spend it? Is it a do whatever you want because nothing counts day (i.e. whatever happens on Leap Day stays on Leap Day), or is it a day to take a real shot at something meaningful? Or maybe a little bit of both. We’re told how to celebrate most holidays, whether it’s with candy and flowers, fireworks, or green beer. But I say that Leap Day should be celebrant’s choice. So, writer friends, it’s up to you. If you’ve been working so hard on a manuscript that you’re revising it in your sleep, perhaps your Leap Day should be spent with crossword puzzles and a bottomless cup of tea, or a double feature of completely mindless entertainment at your local movieplex. Cheesecake for lunch is also a viable option. But if your writerly self has lately been feeling hampered by self-doubts, intimidated by the prospect of success and/or failure, and generally reluctant to strike off in any direction, then perhaps February 29 is your day to take a leap of faith. Send a query. Enter a contest. Register for a conference or sign up for a pitch session. Write a first word, a first line, a first page, a first chapter. You may like it so much that you’ll take Leap Day William’s advice and live every day like it’s Leap Day. Tks for the fresh look. It made my heart leap.